Route Summary: - Grasmere, Goody Bridge, Wainwright's Coast to Coast Walk, Easedale House, High Raven Crag, Helm Crag, The Lion and The Lamb, The Howitzer, Goody Bridge, Grasmere. 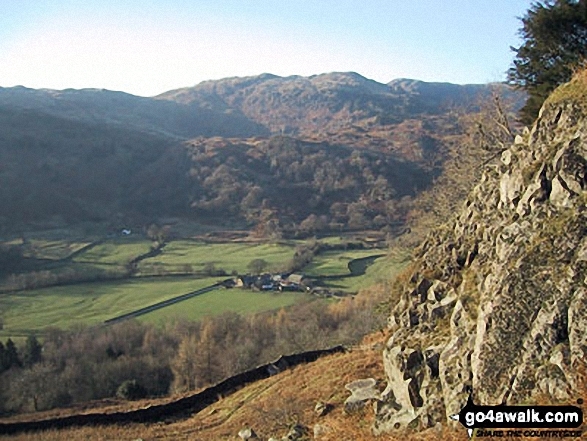 Route Summary: - Grasmere, Goody Bridge, High Raven Crag, Helm Crag, The Lion and The Lamb, The Howitzer, Gibson Knott, Calf Crag, Wainwright's Coast to Coast Walk, Brownrigg Moss, Moor Moss, Far Easdale Gill, Goody Bridge, Grasmere. Route Summary: - Grasmere, Goody Bridge, Ghyll Foot Farm, Green Burn, Greenburn Bottom, Contra Breast, Dead Pike, Steel Fell (Dead Pike), Brownrigg Moss, Calf Crag, Gibson Knott, Helm Crag, The Lion and The Lamb, The Howitzer, High Raven Crag, Grasmere. Route Summary: - Grasmere, Goody Bridge, High Raven Crag, Helm Crag, The Lion and The Lamb, The Howitzer, Gibson Knott, Calf Crag, Brownrigg Moss, Greenup Edge, High Raise (Langdale), Sergeant Man, Belles Knott, Coledale Tarn, Easedale Tarn, Sour Milk Gill, Easedale, Grasmere. NB. To see photographs and pictures from a particular walk choose your walk from Walks or use our Walk Search facility. To see photographs and pictures on, of or from a particular Mountain, Peak, Top or Hill select from Peaks & Mountains' or enter the Mountain, Peak, Top or Hill Name into our 'Photo Search facility.